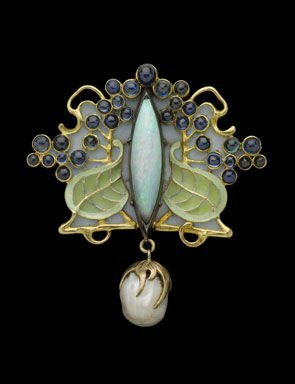 Unlike the previously discussed eras of history that made a significant mark on the history of jewelry, the Art Nouveau Era was one that didn’t center itself on the time-frame, but rather, it centered on the art itself. The Art Nouveau Era took place from 1890 to 1910 and is identified as a period of art history that found inspiration in nature and added to it with beautifully curved fine metals. Art Nouveau was more than just a style, it was a mindset that followed the philosophical idea that “art should be a way of a way of life”. The Art Nouveau periods overlaps the Victorian and Edwardian Era’s and was an unspoken protest of the Industrial Revolution of the time – with more factories arising, this period wanted to demonstrate an appreciation for the decline of natural elements and it’s delicate features contrast the brute aspects of industrialism. Another form of protest against the Industrial Revolution is seen in the desire for handmade goods. Mass production in jewelry was becoming popular during the Art Nouveau Era and with it came the decline in quality and originality. 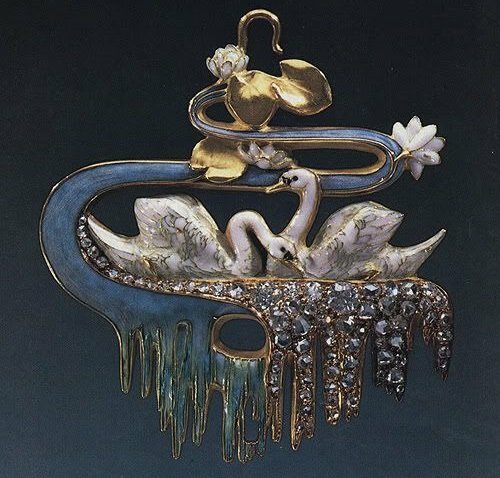 Jewelers during the Art Nouveau Era viewed themselves as more – Art Nouveau Era jewelers likened themselves to artists, putting extra care and dedication to their meticulously hand-crafted pieces. Art Nouveau jewelry contained soft, delicate and romantic features that emphasized on light colors and delicate curves. The most popular stone of the period was a pearl, but the pearls popularity was closely followed by the popularity of pastel shaded gemstones. The Art Nouveau period also introduced a style of craftsmanship called “Pique a Jour”. Pique a Jour is a method of craftsman ship in which two metals form a hole that is filled with a thin layer of enamel – this then creates a delicate solid filling that resembled stained glass. An Art Nouveau wedding or engagement band would be a remarkable choice for someone that holds an appreciation for nature and desires to own a remarkable and unique piece of art history. The Art Deco period followed the Art Nouveau period and took place from the 1920’s to the 1930’s, ending at approximately the beginning of World War One. The Art Deco period is the extreme opposition of the Art Nouveau period and trades feminine curves in for masculine lines. 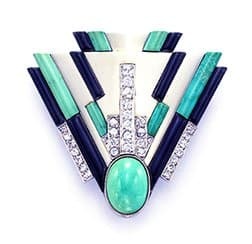 Art Deco is one of the most popular styles of art today and Art Deco jewelry is one of the highest priced on the market. The Art Deco period is marked with women beginning to express themselves, a result of the impending war and the need for factory workers, and in doing so, women chose to downplay their feminine qualities while embracing the masculine ones. Art Deco jewelry is characterized by bold and bright colors and geometric shapes that are marked by sharped and clear lines. One of the most famous creations from this period is the Empire State Building, and though not a piece of jewelry, it does a fine job displaying the components that made this era so popular! With women joining the work force and earning money, jewelry sky-rocketed in popularity because more people were able to afford it. 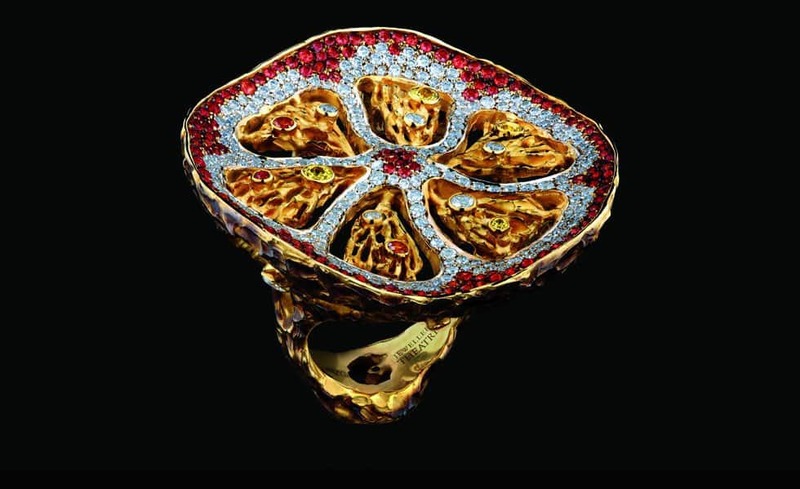 This popularity forced jewelers to outdo one another and experiment with metals and stones in ways that they have not been experimented with previously – every jeweler wanted to create the next big thing. 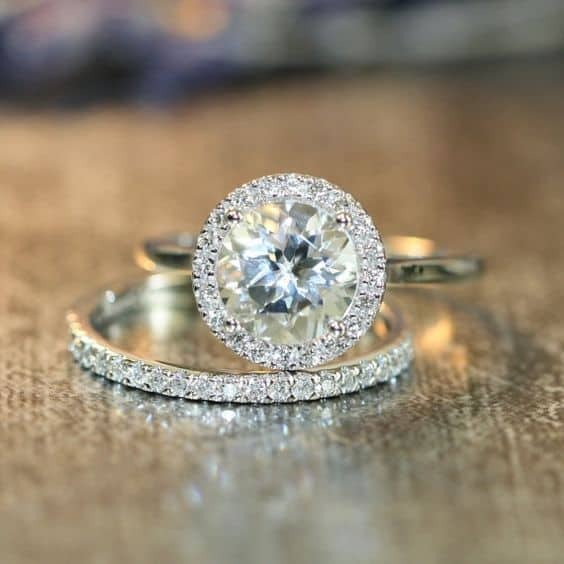 Thankfully, the experimentation with jewelry resulted in something marvelous when the Brilliant Round cut, the most popular cut to this day, was designed by Marcel Tolkowsky. An engagement ring from the Art Deco period is an easy choice for someone that wants to display their strength and originally through their ring while still being able to be confident in the care and quality of the craftsmanship. The Retro era took place after the Great Depression and is considered to date between the 1940’s and the 1950’s. The Retro Era contains many key features of the Art Deco area, but intensified. Jewelry that dates to the Retro Era is often bold, bright and definitely eye-catching. These elements are a direct result of where this Era found its inspiration – Hollywood. Jewelry that dates back to the Retro Era is characterized by bright colors and over-the-top sized cuts. With WWII causing a decline in the availability of platinum, jewelry from the Retro Era is mostly gold. The Retro Era also sees a revival of femininity in its designs through the rise in popularity of ribbon and bow inspired pieces. The Retro Era didn’t see many diamonds – in fact, the most popular stones of the Era were gemstones, and the most popular shades of such were greens and purples due to their ability to beautifully contrast against gold. 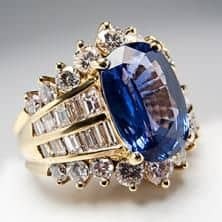 If diamonds were used in the Retro Era, it was sparingly and strictly to draw attention to the beauty of the gemstone. If you want an engagement or a wedding ring that holds its own historical significance while updating the beauty of past eras, a ring from the Retro area is a good place for you to look!